How Can We Identify When Satan Is Scheming Against Us? No matter what culture you find in the world, there is a universal belief in Satan. Likewise, each culture has their own idea of what Satan looks like and names that they use to refer to him. However, the one thing that most believe about Satan is that he makes it his mission to torment us whenever and however he can. With this in mind, how can we identify when Satan is scheming against us? What does the Bible say about Satan and demons? Satan, also known as the devil, was created as a beautiful cherub (angel) named Lucifer that rebelled against God (Ezekiel 28:13-17; Isaiah 14:12-15; Revelation 12:7-9). When he rebelled, he led one-third of all the angels to rebel with him. This rebellion resulted in God casting Lucifer, now known as Satan, and the other angels, now known as demons, out of Heaven and down to earth. God also limited their power and freedom (2 Peter 2:4-9). In their desire to have more power and influence, demons often try to take the possession of the bodies of men (Luke 8:36). They physically assault men (Luke 4:35; Luke 9:42). They drive humans to insanity (Mark 5:2-5). They effect man’s ability to communicate (Mark 9:17-29) and they seduce humans to ignore God and listen to false teachings (1 Timothy 4:1). Simply stated, demons, led by Satan, are still angels that have amazing supernatural power. What is Satan’s desire and how does he operate? We can see by what the Bible says about Satan, his names, and the actions of demons, that he has a definite way that he operates. Therefore, to best identify when he is scheming against us, there are several things that we need to do. First, we must trust Christ as our Savior. This will ensure that we have the Holy Spirit in us who will defend us (Psalms 20), empower us (1 John 4:4), and give us the ability to discern the truth of God’s Word (1 Corinthians 2) and recognize deception (Luke 21:8; 2 Corinthians 3:12-15; 1 John 4:1-4). Second, we need to study what God’s Word teaches so that we can rightly apply the teachings of Scripture to our lives and to every situation we encounter (2 Timothy 2:15-18). We need to do this so that we can recognize what is the fruit of the Spirit (Galatians 5:22-23) and the fruit, or works, of the flesh (Galatians 5:16-21). When we know the normal of what God’s Word says, we can easily see unbiblical teaching and life choices as abnormal. 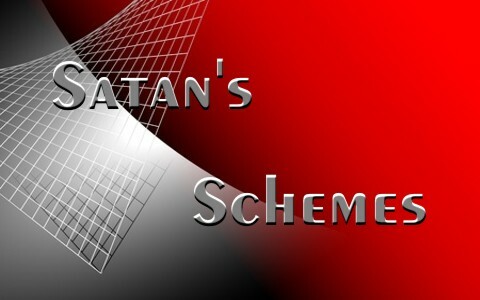 How can we defend ourselves against Satan’s schemes against us? Whenever we encounter the works of the flesh, we should think of them as the red flags of Satan at work. The works of the flesh are the result of being drawn away from what God wants by our own selfish lusts that tempt us. These lusts do not come from God. They are the lust of the flesh, the lust of the eyes, and pride (James 1:13-16; 1 John 2:15-17). On the other hand, we should look at the fruit of the Spirit as the green flags of God at work. They are generated by the love of God because of what He did for us by dying on the cross for our sins (1 John 4:19). This love inspires us to live for Him and demonstrate our love by loving our neighbors unconditionally (Luke 12:28-31). Although Satan has supernatural power, as believers we must understand the he is not as powerful as the Holy Spirit that lives in us (1 John 4:4). However, we can be greatly influenced by him, especially when we are mentally compromised by drugs and alcohol and/or a lack of Biblical literacy. Likewise, with the power of the Holy Spirit we cannot blame our choice to sin on Satan. Therefore we must consistently examine ourselves to see where we stand in light of Biblical teaching (1 John 4:12-19). When we recognize our shortcomings we must also refrain from blaming our sinful choices on Satan or others (Genesis 3:9-13). Finally, we must make the effort to attend a good church that teaches directly from the Bible in a way that not only demonstrates a Spiritual application, but also a practical application to our lives (2 Timothy 2:1-7). This combined consistent prayer (Matthew 6; 1 Thessalonians 5:17), Bible study (2 Timothy 2:15), spending time with other believers (Proverbs 11:14; Proverbs 24:5), and volunteering to serve in a ministry outreach (Philippians 2:1-4) will help arm us with what we need to identify when Satan is scheming against us (Ephesians 6:10-18) and what action to take. To identify when Satan is scheming against us we should do several things. We must know what the Bible says about Satan and demons. We must also know what is Satan’s desire and how he operates. When we know these things and have a Christ-centered life we can better identify when Satan is scheming against us and know how to defend ourselves against his schemes. Related reading: Is There Really a Being Called Satan? Resources – Scripture quotations are from The Holy Bible, King James Version. Williams, Michael, (2013). Bible Doctrines. Albuquerque, NM: Selah Mountain Bible Institute. While, as a non – Christian, I am not qualified to comment on the theology of your essay, I do feel that I can point out a significant error in your lead paragraph. Many cultures do, of course, have figures, often Gods, but not always, that are supernatural supernatural agents of evil in the world. But there are plenty of cultures that have no such entity, and many others which have adversarial entities, but nothing analogous to Zoroastrian or Abrahamic dualism. I like that name Shannon, whether it be a male or female name ! It’s very nice ! God bless you guys ! Satan is always after me always never giving up. He liked to straight up lie and try to make me think other wise of things like my faith . Like no matter what I think or do I’m doomed . I think that is not right an no matter what I do because I’m a sinner and flesh and blood im still saved . because of what jesus did for me on the cross. I believe no matter how terrifide I get over it . I still believe jesus will save me and he loves me . So the point of this article was to fend off Satan you have to go to church. Is there really a Satan or is Satan just symbolic of humans following their free will in opposition to God’s will. Perhaps Satan just represents mans propensity for doing bad things to other people and failing to honor God. Some of these antiquated concepts of a red devil with horns and a tail and God sitting on a throne some place where the streets are lined with gold seem just plain silly. They make you question the very existence of either. Religion can’t define what God, the holy spirit,the soul, or the devil are or what they are made of so we are left with this antiquated imagery. Thanks Dr. Mike. I quite appreciate this article on how to identify when Satan is scheming against us. It throws a lot of light on the subject matter for believers in particular and all those who are yet to be saved in general. The copious scriptures you cited made it all the more interesting and convincing. This is indeed a “tools box.” God bless you Sir. Previous post: The Herods In The Bible – Do You Know Them?